First and foremost, I must thank my sweet and lovely friend, Ms. Darcy, for emailing this to me. I just thought it was another recipe or craft that I would mess up from Pinterest. But upon opening it I sighed. I actually sighed. It was either the quote or the visual of my dear Mr. Darcy or a combination of both. Just another reason why I love Colin Firth-these sentiments are perfect. And so, without further adieu, I must pass on this very important public service announcement about reading. Enjoy! 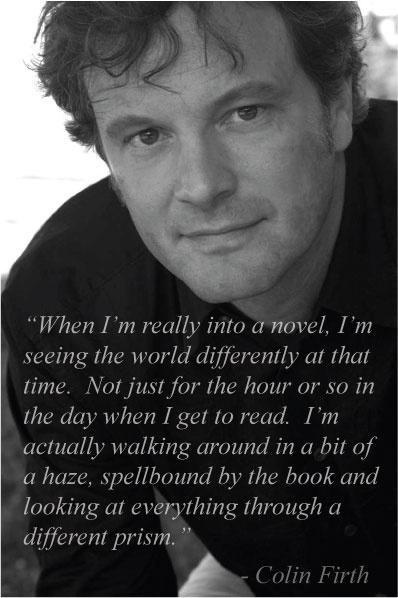 Tags: Colin Firth, Quotes, reading. Bookmark the permalink.